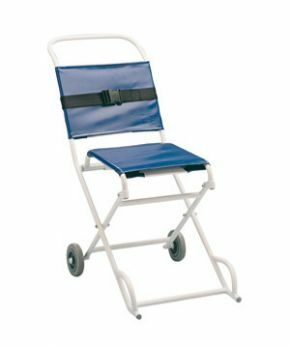 Manufactured from plastic coated steel tubing this evacuation/ambulance chair is supplied with wipe clean blue polyester matt finished seat and back upholsteries. Two 125mm (5”) grey non marking wheels and a nylon webbing safety strap. Its design incorporates front and back carrying handles and when not in use can be folded flat. Ideal for transporting people up and down stairs. Brilliant value evacuation chair and we had delivery within 2 days .